Choose from 42 hotels and guest houses in West Sussex. Shown below a just a selection of the hotels available. To search within an area please use the menu on the right. 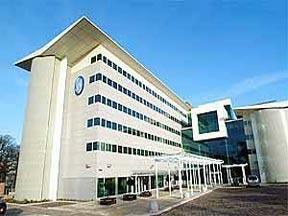 Ideal for Gatwick Airport, this hotel offers inclusive airport parking packages, restaurants, bars, and a health club. The Gatwick Europa Hotel has a style all of its own, with heavy influences from Spanish and Mediterranean architecture. Enjoy a drink in the secluded courtyard garden, or gaze at its central fountain over a carvery meal in the restaurant. A leisure club offers ample opportunity to relax or work-out, with a heated indoor swimming pool and gym both among the facilities. The hotel is far enough from the airport so that no aeroplanes will disturb your sleep, yet close enough to ensure a fast and convenient airport transfer in the morning. Transfers to and from London Gatwick Airport are available at an additional cost. With its own junction on the M23 and Wi-Fi internet access, the Gatwick Europa Hotel is well connected in every sense. 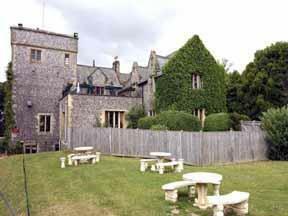 On the A27, Premier Inn Arundel has free parking and is close to Arundel Railway Station and the centre of Arundel, with its castle, cathedral and the Wildfowl & Wetland Trust. Enjoy countryside walks, from the Premier Inn Arundel, a 10-minute drive from the seafront. Goodwood Racecourse is 10 miles (16 km) and Brighton 17 miles (27 km). 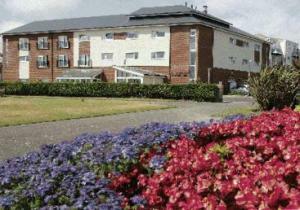 The hotel has en suite rooms, meeting facilities and an on-site Beefeater restaurant, serving char-grilled food. Some rooms can take 2 adults and up to 2 children (under 16 years). The 2 children also get a free full breakfast when accompanied by an adult eating a full breakfast. Breakfast includes the expected cooked items, including vegetarian sausages. There is also a wide continental selection. The only hotel linked by covered walkway to the South Terminal at Gatwick Airport, this Hilton hotel has over 800 rooms and is 30 minutes from central London. The Hilton London Gatwick Airport has 2 restaurants, 2 bars, a coffee shop, LivingWell Express Gym, dry cleaning, 24-hour reception, concierge and room service. All bedrooms have high-speed internet access. Family rooms sleep up to 5, and executive accommodation has access to the Executive Lounge. Set within 89 acres of Sussex parkland, this elegant and recently refurbished Georgian manor house boasts a wide range of facilities for both corporate and leisure guest During your stay, make the most of the hotel's comprehensive leisure facilities which include an on-site 18-hole golf course, heated indoor and outdoor swimming pools, fully-equipped gymnasium, beauty treatment rooms, tennis courts, squash court, aerobics studio, putting green and croquet. This charming 16th-century country farmhouse has a great location just a few minutes from London Gatwick Airport. Fly and Park rates are available. When it's time to unwind, try the hotel's leisure club with its fully equipped gym, squash courts, steam room, Jacuzzi and swimming pool. The Brasserie restaurant has an excellent choice of carvery, themed and children's menus. Enjoy afternoon tea and light meals in the tranquil library bar. The White Swan, the quaint traditional Sussex pub offers tasty rustic meals and overlooks the pond and spacious garden. There is a small overnight charge for parking whilst staying at the Copthorne Gatwick Hotel. There is a shuttle service to Gatwick Airport from 05:05 to 22:00 (at an additional cost). Just 2 miles (3.2 km) from Bognor Regis Railway Station and the town centre, and only 5 miles from Goodwood Racecourse, the hotel is located on the A29 and offers great value and free parking. The Premier Inn Bognor Regis has good access to the area's major roads and is within easy reach of all of the shops, pubs and restaurants of Bognor Regis. The hotel has a 24-hour reception desk and some rooms can take 2 adults and up to 2 children (under 16 years). The 2 children also get a free full breakfast when accompanied by an adult eating a full breakfast. An all-you-can-eat breakfast buffet is available each morning and includes the expected cooked items such as scrambled, fried, poached or boiled eggs, and pork or vegetarian sausages. There is also a wide continental selection. The Robin Hood Chef & Brewer is a traditional country pub with open fires and offers freshly prepared meals made with the finest ingredients available locally. Located 200 metres from the sea and local shops, The Aldwick is a small family-run hotel with a restaurant. The hotel has 8 bedrooms, a lift to all floors and a patio for outdoor dining. 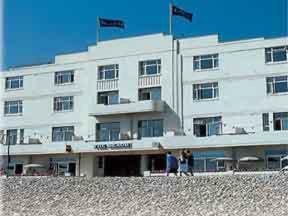 The hotel is just west of Bognor town centre, which can be reached by walking along the promenade. Goodwood and Fontwell racecourses are a short drive away. The Aldwick is also near to Chichester, historic Arundel and many marinas. With free parking, a restaurant and bar, this peaceful Edwardian hotel is beside the sea. You can smell the fresh, salty air even on a calm day. Located on the Edwardian promenade in the popular seaside resort of Worthing, The Kingsway Hotel is a quiet home from home. There is a lift to all floors. All rooms have en suite facilities, telephone, Freeview TV and hospitality tray. Most also have a trouser press and ironing facilities. A restaurant is on the ground floor and has a table d'h?te menu. The sea-facing bar has a large selection of dishes available day, with a selection of locally caught fish among them. Contemporary, warm and friendly, the Russell Hotel and restaurant has spacious en suite bedrooms fronted by landscaped Marine Park gardens and the sea beyond. The hotel has accessibility features for guests with visual impairments. It caters for guide dogs, and other dogs are also welcome (on request). Russell Hotel has an indoor pool and gym. In Bognor Regis there are award-winning sand and shingle beaches that proudly fly the Quality Coast Award for being clean and safe with good facilities. Stroll along the promenades; visit Hotham Park, a historic park and ideal picnic spot; or travel to Goodwood. One mile from the town centre and close to Crawley Rail, Premier Inn Crawley South (Goffs Park) comes with a Brewers Fayre restaurant, meeting rooms and comfy budget bedrooms. Local attractions include Strathclyde Park, the River Clyde and K2 Leisure centre. Gatwick Airport is about 7.5 miles (12 km) south of the hotel. Some rooms at Premier Inn can take 2 adults and up to 2 children (under 16 years). The 2 children also get a free full breakfast when accompanied by an adult eating a full breakfast. The full all-you-can-eat breakfast has the expected cooked items, including vegetarian sausages, as well as a wide continental selection. A 10-minute transfer from Gatwick Airport, this Premier Inn has good rooms and an on-site restaurant. It is walking distance from Manor Royal Business Park. Premier Inn Gatwick Airport South is located in the grounds of the 14th-century Gatwick Manor, where the remains of the moat can still be seen. It has incredibly comfy beds and free private parking. Some rooms at Premier Inn can take 2 adults and up to 2 children (under 16 years). The 2 children also get a free full breakfast when accompanied by an adult eating a full breakfast. The full all-you-can-eat breakfast has the expected cooked items, including vegetarian sausages, as well as a wide continental selection. 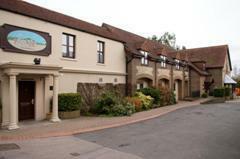 The Best Western Old Tollgate Hotel is situated in the lovely old Sussex village of Steyning. 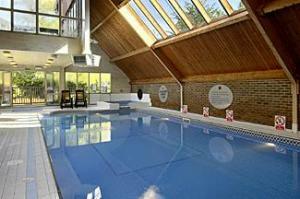 The hotel is located within 38 kilometers of Gatwick and Brighton. The bedrooms are all en-suite and luxuriously appointed with a mini bar, tv (with Sky), radio, direct dial telephone, tea and coffee making facilities, trouser press and hair-dryer. There are two suites and two four poster bedrooms, the four-posters having Jacuzzi bathrooms. There is a beautiful garden area and free parking on site. The Restaurant - better described as visual a la carte, has been a popular eating spot with locals for many years being voted Worthing's restaurant of the year on many occasions. The hotel is entirely non-smoking.